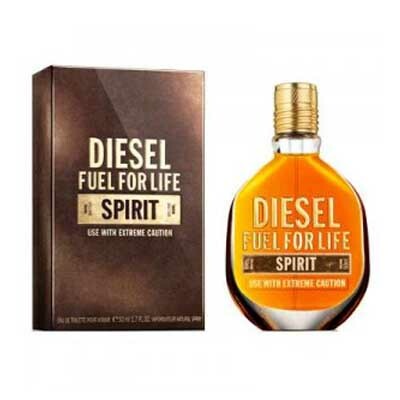 Fuel for Life Spirit is a popular perfume by Diesel for men and was released in 2013. The scent is sweet-spicy. It is being marketed by L'Oréal. I have never been a Diesel person, or a Lacoste person, or an Abercrombie person for that matter. I don't fancy easy hype fashion trends or overhyped labels. I like my good old Lee and Wrangler jeans, my always trustable Springfield and Dutti sweaters and shirts, my confy Adidas and Vans sneakers, my smooth fit Coolway boots, my durable Rockport shoes, my smart Shott jackets, my never aging Pepe Jeans socks, my right size H&M underwear, my fancy Rochas scarfs, my stylish Caramelo blazers and suits, my old style Burberry raincoats ... Diesel just seems not to fit in my consumer philosophy. As you can see, I am far from being a single brand person. Over the years I developped my preference over some brands and for some particular items. But I am also very flighty with those sort of trusted brands and sometimes I change my brand preferences. Till very recently, I never bought any Diesel branded goods. A couple of weeks ago I bought a Diesel perfume, "Fuel for Life Spirit". This long explanation serves only the purpose to make clear that I did not bought this fragrance due to the hyped Diesel brand name. On the contrary! The hyped Diesel brand name kept away from paying attention to Diesel fragrances. Quoting my coleague "Chnokfir" in his magnific review, Diesel had so far "meaningless fragrances, paired with questionable bottles such as vivid green DDT spray dispensers, red cones, scruffy flasks and clenched fists". This type of presentation also did not help much to raise my interest in Diesel as a fragrance designer. Till a couple of months ago, all the scents I had experimented from Diesel were what I usually nickname as "chicken soup" fragrances. 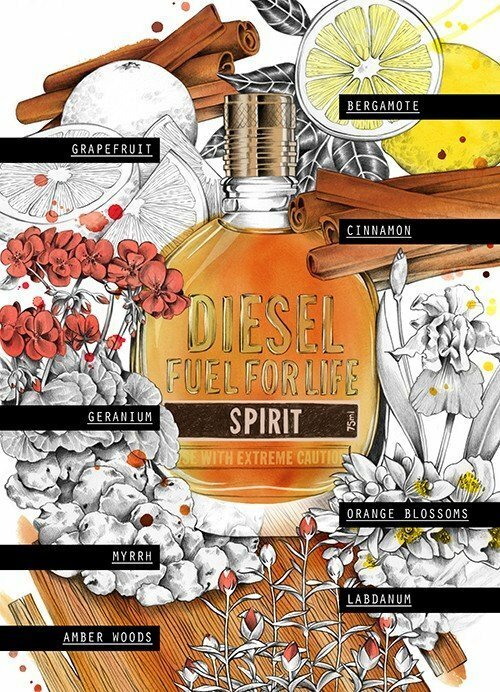 After trying "Fuel for Life Spirit" I immediately recognised that there was more than just useless hope in what Diesel fragrances were concerned. Other scents I love, immediately arised to my mind. Fragrances like "Eau des Baux", "L'Homme Intense" and "Jaguar Excellence Intense" for instance. "Fuel for Life Spirit" is not exactly an intense fragrance but the scent is really pleasant. Nevertheless, so far it's the only perfume I own from this designer. I also must confess that I am not curious about trying any other Diesel bottle. This fragrance opens with a mildly sweet quality cinnamon freshened by citrus. The development heart sustains that mild sweet vibe with some flowery notes. In the bottom we are indulged with a very pleasant incense, amber, resins and woody manly accords, that will endure through the also very agreeable drydown. It's not really a unique fragrance, as it follows the steps of other designers. 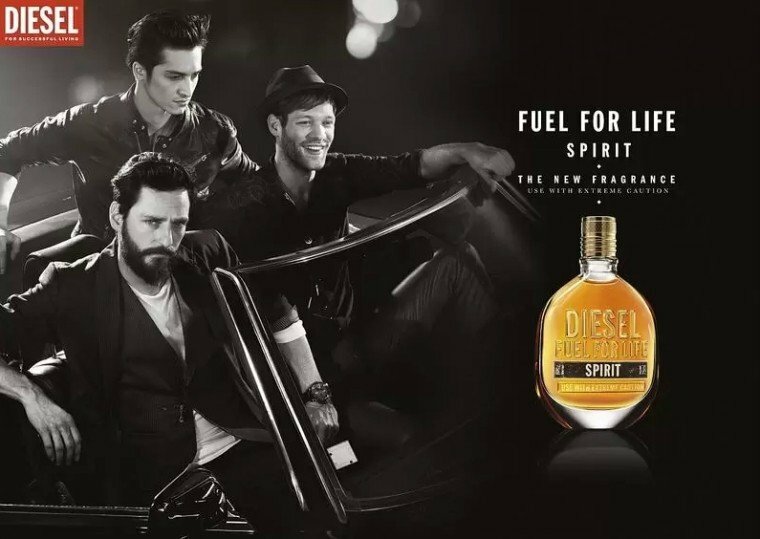 Diesel aimed at making an adequate quality fragrance fit for the 21st century masculine taste. Besides the related perfumes I already mentioned, I also may suggest similar vibes with D&G The One, Altamir, Gaultier2, and some fragrances similar to 1 Million, but less sweet, like 1 Million Privé or Haloween. How do I rate this Diesel scent that doesn't smell like diesel oil? This is good manly fragrance, on the sweet side, with a pleasant cinnamon opening and an oriental ambery incense drydown. But it's also expensive if compared with similar scents. Altamir from Ted Lapidus is a similar fragrance (actually better in my opinion) and costs less than half the price of this Diesel perfume. Recommended? It's easy to recommend this nice scent but consider a similar fragrance for a lesser price unless you are willing to pay for the Diesel brand name. Blind buy worthy? Yes, with no risk if you don't care about this brand high price! Music: Blackmill - "Spirit of Life"
Back in 1990: The author of this review fancies - other than "Photo" by Lagerfeld, "Obsession" by Calvin Klein or "Nightflight" by Joops - those dark blue chucks, the red jeans and white T-shirts with that black Diesel/Indian emblem. This was just as "IN" as Chiemsee, Ed Hardy, Abercrombie & Fitch or Hollister. In the 2000s not only the clothing style of the writer has changed slightly, but also the image of the Diesel line. Relatively meaningless fragrances are paired with questionable bottles, such as vivid green DDT spray dispensers, red cones, scruffy flasks and clenched fists. In this connection, the author cannot help but think of the memorable interview with the punk stars Bela and Farin (die "Aerzte") (= the "doctors") and ... while elaborating about sexual preferences, those "doctors" pointed to a spot above the elbow and said that "everything below that point is still fun"! So, well, the level of some of the Diesel scents ranges well below some raunchy doctors jokes. 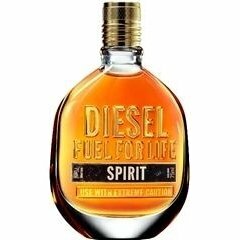 But I have to admit that with "Fuel for Life Spirit" the house of Diesel has had a stroke of luck; I for once have nothing to complain about. An unusually discreet golden brown carton with understated print. A bottle which reminds me of the field flask, but fortunately without the half-rotten jute cover; instead, a raised lettering on the glass, discreetly gilded. Feels good in the hand, easy to spray: it fits! Already at the first spray, you know where the ride will go: it is spicy and sweet. A not-at-all Christmas-type cinnamon makes the opening and is supported by a sweetness which seems to come from a not very citric grapefruit. After that, sweet and flowery blossoms follow. A non-scratchy incense fits perfectly with the cinnamon and woody notes offer a soft and warm support. Warm and yet masculine. It is nice when a scent gives me a warm welcome and there are no ugly surprises, as are in some other current scents. Instead, "Spirit" is fully and intensely present without getting on my nerves. Warm and smooth like a good Bourbon, spicy and pleasantly male. Sillage is strong, but still tolerable in an office environment; longevity rates an enthusiastic OK with almost 10 hours, as the scent is fading away in a linear fashion. This is what I like!